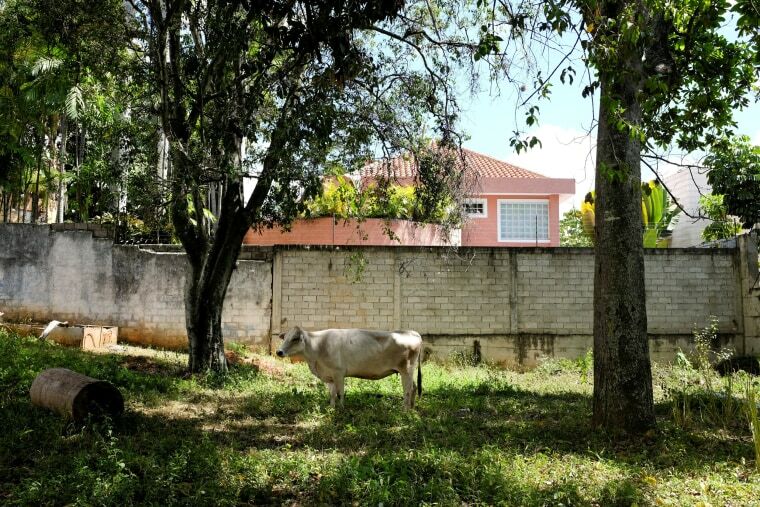 “You see stuff like that in the country, but never in a city," said a resident about seeing cattle grazing in a wealthy Caracas neighborhood. CARACAS, Venezuela — A socialist commune has drawn the ire of its neighbors in a wealthy area of Caracas with an unusual response to the hyperinflation and food shortages afflicting Venezuela: turning its backyard into an urban cattle pasture. The leaders of the Apacuana commune, devotees of socialist President Nicolas Maduro, drove six hours to purchase 11 450-kilo (992-lb) cows. They set them to graze behind their 2,000-square meter (21,528 square-foot) home, donated by the state-owned telecommunications company two years ago. With Venezuela’s oil-reliant economy in a fifth year of recession and inflation nearing 1 million percent, securing staple goods is a daily struggle for many. Just 40 percent of families can afford beef and nearly two-thirds of the population reported losing weight last year, by 11 kilos (24 lb) on average, according to a study by three universities. Western economists and the domestic opposition blame Maduro’s heavy-handed policies and economic mismanagement for the crisis. However, the government and its supporters attribute Venezuela’s struggles to U.S. sanctions and hoarding by businesses trying to undermine socialism. “This experience shows the resolve of the people to push back against the economic war,” said commune leader Sulimar Pedrozar, as two cow heads boiled in a pot over a wood fire and a group cleaned out a cow stomach for a soup. Pedro Méndez, a local opposition leader, said he would report the urban ranch to Venezuela’s health ministry, but doubted the government would stop it given Maduro’s support for such communes. “There is resistance to this idea but those who want to let people die of hunger are crazier,” Pedroza said.